How do you want to hike the Tour du Mont Blanc? You can choose to employ a Guide on the Tour du Mont Blanc or you can undertake the tour yourself – self guided TMB. With the former option, you will be led by an experienced and fully qualified International Mountain Leader. Using years of experience, local knowledge and a real love of the mountains they will ensure the trip runs smoothly and take care of the day-to-day operations. Taking a Guide on the Tour du Mont Blanc will cost a bit more, but it saves you a lot of time and gives a higher level of safety. If you prefer a self-guided Tour du Mont Blanc, we will book your accommodation, transfer your luggage between hotels and supply you with Route Notes of the trek. There will be an emergency procedure, list of essential phone numbers and staff in Chamonix should you need further help. Suitable mountain skills and previous mountain experience is essential. You should know how to confidently use and interpret a map and compass. You need to be conscious of hazards whilst trekking in a mountain environment. 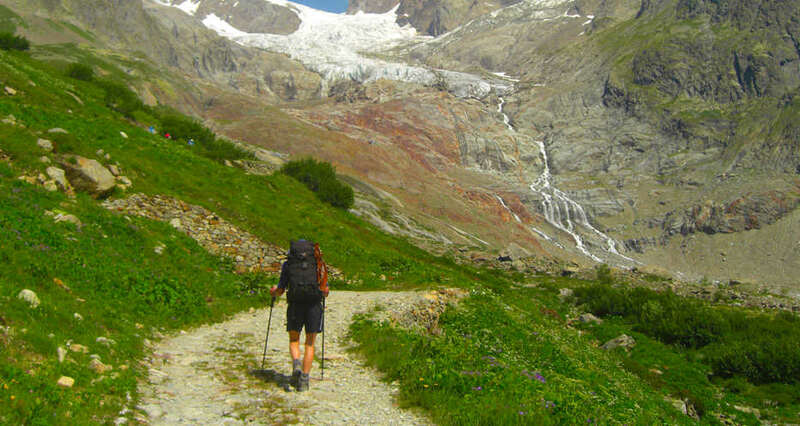 The traditional way of trekking the Tour du Mont Blanc is in an anticlockwise direction. However, over many years we have concluded that you are better hiking clockwise. If you go anti-clockwise you cross three huge mountain passes at the beginning of the trip: this means a lot of physical effort when you are just finding your trekking feet and getting used to the higher altitudes. In addition, our hotel owners report that many hikers are anxious about being able to cross these passes – particularly between Les Contamines and Les Chapieux – and the atmosphere at the hotels is tense. By travelling clockwise, the first few days of the trek are easier and you get fitter and acclimatised without the stress. It means that crossing the big passes on the last three days are much more enjoyable. The Tour du Mont Blanc follows a well-established trail and many of the pathways are sign-posted. However, parts of it cross through some wild and remote mountain areas and you should be aware that mountains can be hostile places. You should take special care and attention if you cross any streams: these can quickly become hazardous, particularly if a rain storm is combined with early-season snow melt. Special attention must be paid to the weather. Rain storms, lightning, fog, mist and even snow are not common – but not unusual – and you need to be able to safely navigate in these conditions. Snow can be a hazard of early summer, where whole sections of the route at higher altitudes – particularly at mountain passes – may be covered in winter snow. The possibility of collapsing snow bridges, or a slip that may result in a long slide, can both cause serious accidents. You should be confident that you can safely and competently cross snow; if you are not confident you should not attempt it and either take a different route or public transport. Mobile phone reception is very poor or non-existent between the sections that go from Courmayeur to Les Chapieux to Les Contamines. In case of an accident, calling the mountain rescue in this area can be seriously delayed and you will rely on telephone landlines at the refuges that are located intermittently along the main TMB trail. GPX can be useful on the Tour du Mont Blanc, but they cannot be wholly relied upon. Routes change – sometimes daily; paths get washed away; large landslides can wipe out a regular path. Local hazards, such as stream crossings and snow crossings mean the GPS route may not be appropriate at the time you encounter them. The TMB is a high-mountain trek and using maps, compass and your own broad mountain experience is a lot safer than relying on GPX. For the trip we operate, you stay in hotels for 9 nights and an auberge for 1 night. Rooms are on a twin-share basis: all have attached bathrooms except at La Forclaz and Les Chapieux where the bathrooms are along the corridor. For the night at Les Chapieux, you may be in a twin, triple, quad or small dormitory with showers along the corridor. Bedding is provided at each night stop, so there is no need to carry sleeping bags. For the night at the auberge at Les Chapieux, duvets and pillows are provided. Towels are provided at all night stops. Please note that we do not use mountain refuges or huts for any of the night stops. Meals included are normally a set 3-course meal and are eaten in the hotel’s restaurant area. Tea and coffee at dinner and all other drinks are not included. On the Self Guided trek you are responsible for providing your own lunches.